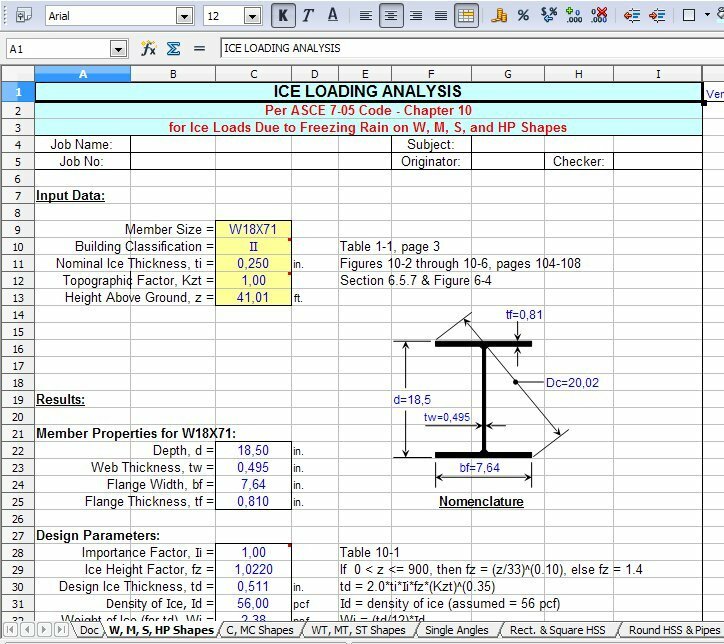 ASCE705I is a spreadsheet program written in MS-Excel for the purpose of determining ice loading due to freezing rain on structural steel members per the ASCE 7-05 Code. Specifically, coefficients and related and required parameters are determined in order to compute the ice loading on various types of structural steel members. 1. This program specifically follows Chapter 10.0, Ice Loads - Atmospheric Icing, of the ASCE 7-05 Standard, "Minimum Design Loads for Buildings and Other Structures". 2. This program determines the ice loading based on the ASCE 7-05 Code defined circumscribed diameter for the particular shape, and for comparison purposes, it also computes the ice loading based on the actual perimeter of the shape. 3. This program uses the database of member dimensions and section properties from the AISC Version 13.0 "Shapes Database" CD-ROM Version (12/2005), as well as those listed in the AISC 13th Edition Manual of Steel Construction (12/2005). 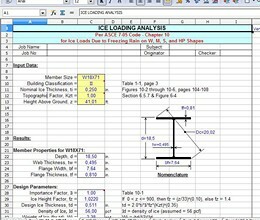 * ASCE705I download link provides freeware version of the software. ASCE705I has been rated 5.0 out of 5 points. A total of 1 votes cast and 0 users reviewed the software.